This recipe is for those of you who are using your pc or laptop as a htpc or just like using Media Center for your media playback needs. Most people do not realize it but any PC running Vista Home Premium already has Media Center built-in. 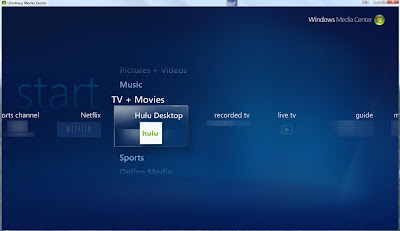 Recently, Hulu launched a desktop client that made watching Hulu on a HDTV a lot easier. Windows Media Center remotes work just fine in the desktop client and is very easy to navigate using either a remote or even gamepad. 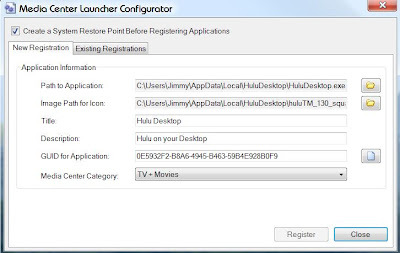 However, if your using your laptop/desktop as a HTPC, you prob would like to have easy access to launch the Hulu Desktop client. This recipe will explain how to use a very useful application to do this (original created by mikinho, updated by chad dyess). This will basically give you Hulu in Media Center (or the closest you can get for now until its natively supported by microsoft). Top this off w/the new Netflix addition and Windows Media Center sure got a boost of online content! 3. Run the Media Center Launcher Configuration Utilty by going to your Start Menu (no desktop shortcut is created). 4. On the configuation screen, click the folder icon to browse for the huludesktop.exe file. By default it installs to the C:\Users\YourUserName\AppData\Local\HuluDesktop\ area. Click on the Huludesktop.exe and hit Ok. The second field: Image Path for Icon, is optional. I downloaded a square Hulu logo from Hulu’s presskit and put it in the same folder as my huludesktop.exe file and then browsed to it and selected it. The third field is the name you want the shortcut/icon in Media Center to show. The fifth field is the GUID for the application, you can use the default or genereate a new one by clicking on the button to the right. Finally, the sixth field/dropdown lets us choose where the shortcut/icon will be placed in Media Center. I prefer the TV + Movies area. 5. Now click on Register. Let the tool work (should be fairly fast) and once its done it will pop a confirmation and click on the OK. The nice thing about this is that Hulu’s client is optimized for HDTVs and in turn most mce remotes will work fine in the hulu desktop client. enjoy!